Boyton churchyard is a place of quiet reflection and habitat for rare plant and animal species. The good management of a churchyard needs to take into account a range of issues, from the burial rights of parishioners to the wildlife management of the churchyard. 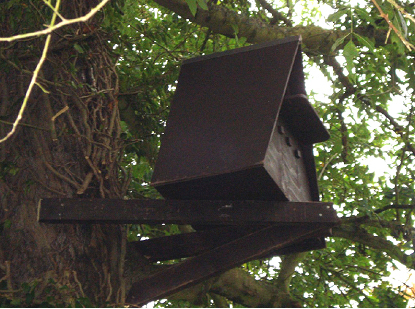 At the right time of year lots of Saxifrage flowers can be spotted and more recently the parish council has enabled the installation of owl nest boxes (picture) which should encourage more Barn Owls to come to the area. Several unusual species of bat live in the church and can be seen emerging during summer evenings. Recent storms have led to several tree falls and some work needs to be done to tidy things up. It is not always widely known that everyone is entitled to either a burial service or to have their ashes buried in their local parish churchyard by their local parish priest regardless of whether they attended church or not. In addition the interment is final with no fee having to be paid apart from the funeral service itself. Indeed records show that over 800 individuals have been buried in the churchyard since 1813 and probably many more before that! The Local Government Act 1972 provides that "a burial authority may contribute towards any expenses incurred by any other person in providing or maintaining a cemetery in which the inhabitants of the authority's area may be buried". This allows for local authority assistance in the upkeep of churchyards in use. In the past Boyton Parish Council have offered support for the upkeep of the churchyard and we hope that this will continue.